DETAILS Like the birds nest, the gathering of material is half the fun when you make this milk carton birdhouse. Find sticks, leaves, grasses, pods, whatever nature has left lying on the ground. Cut a door in a cardboard milk carton. With a glue gun, glue on nature's bounty, covering the carton completely. This project is not going to win any awards, in fact the finished product is, quite frankly, ugly. We did it because the children loved making the bird’s nest, especially the gathering of nature’s materials. What else could we do, with leaves, sticks, grasses and the stuff nature had left on the ground, I wondered. So, by cutting a door in a milk carton and gluing nature’s bounty all over it, we created a birdhouse. 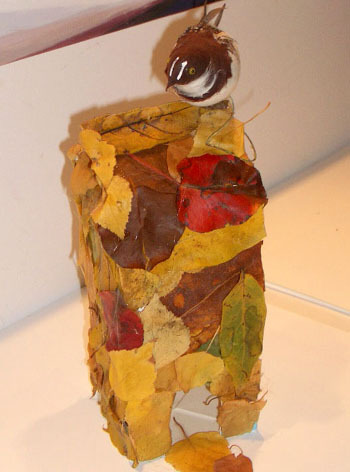 This isn’t really about handsomely housing birds, but about foraging for the stuff and using the glue gun.